Our most exclusive styles, with innovative features. Hunter Douglas Duette® and Duette Architella® honeycomb shades keep your home warm in the winter and cool in the summer. An array of fabrics and a Vertiglide™ option for large windows and sliding doors make it the top-selling product in the industry. 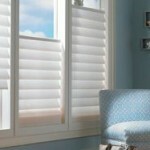 Transform the sunlight through your windows with Hunter Douglas Silhouette® window shadings. Perfectly illuminate your surroundings by diffusing harsh sunlight and dispersing it evenly throughout your room. Hunter Douglas’ innovative Pirouette® window shadings feature soft fabric vanes attached to a single sheer backing that, when open, appear to be floating as they draw natural light into your room. When closed, they look just like a contemporary shade. Similar to draperies, Hunter Douglas Luminette® vertical sheers and modern draperies are ideal for larger windows and sliding glass doors. 180-degree rotating fabric vanes put you in control of your natural light and privacy. A fashionable take on traditional Roman shades, Hunter Douglas Vignette® Modern Roman Shades roll, stack, and traverse with consistent folds and no exposed rear cords for enhanced child and pet safety. 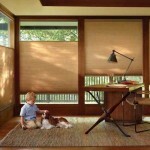 Hunter Douglas Skyline® Gliding Window Panels are a patented twist on vertical blinds. A sleek, up-to-date design lends drama to any décor, whether covering large windows or when used as a unique room divider.